Our 2017 Road Trip, Part 30: The Dragon Experiment « Midlife Crisis Crossover! 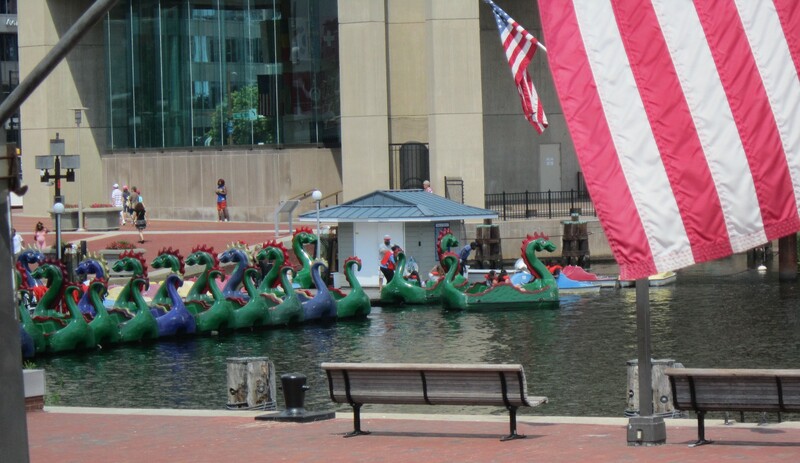 One of the more interactive activities in Baltimore’s Inner Harbor is Team Chessie, a fleet of four-person dragon-shaped paddleboats available to rent for short excursions into a generous but clearly demarcated section of water. (Fun trivia: “Chessie” is a portmanteau of “Nessie the Loch Ness Monster” and “Chesapeake Bay”.) Over the past few days we’d walked back and forth past their kiosk and seen them from any number of angles while visiting other attractions. 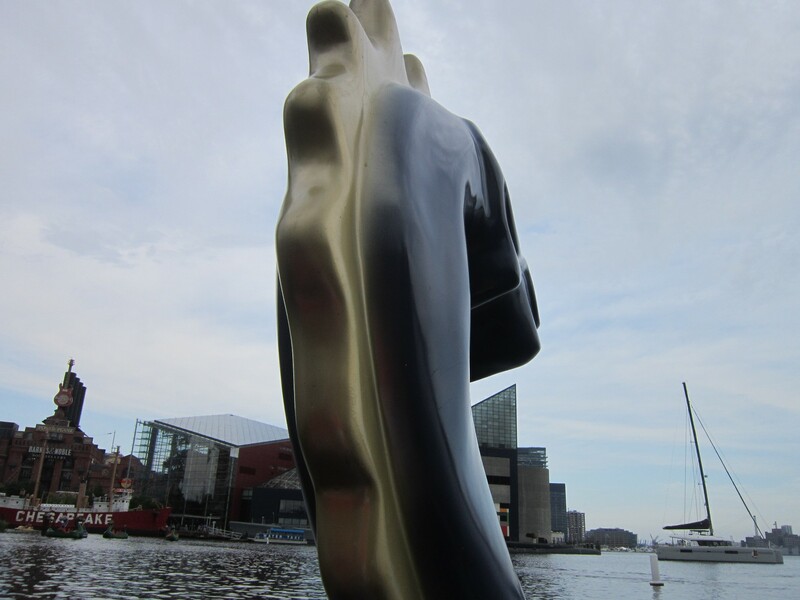 A view from the deck of the USS Constellation. 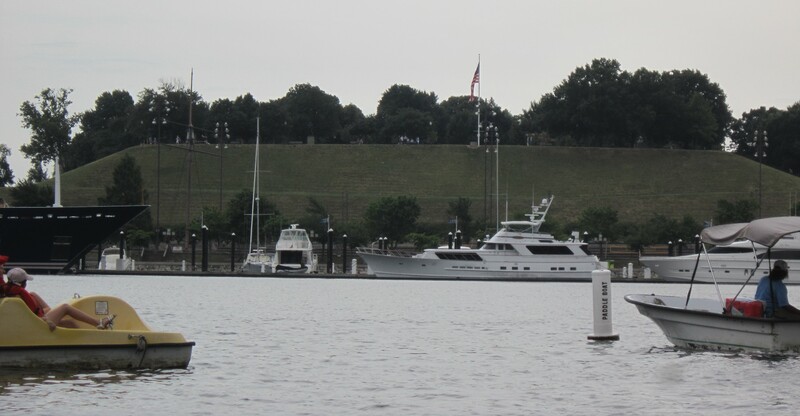 You’ll notice the Inner Harbor also boasts a proud American flag collection. Anne really wanted to try the dragon boats. They looked fun. We had money in the budget. They had charming faces. I had my doubts. We’ve ridden a paddleboat at least once before — a Swan Boat in Boston’s Public Garden, where a trained professional did the pedaling for us. I’d never helmed such a craft myself before. 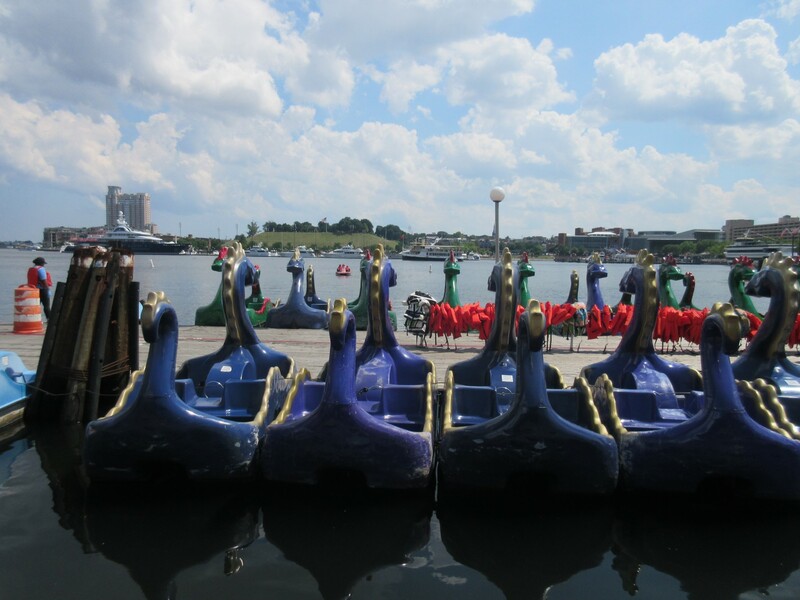 Granted, each paddleboat is equipped with a pair of pedals to allow for a pilot/copilot team effort. It’s not like I would be alone out there while Anne stayed standing and just kept yelling at me, “STROKE! STROKE!” On the other hand, if our dragon went belly-up or was rammed by an oncoming water taxi or spontaneously exploded, and if we survived impact and if heartless seagulls didn’t pick that moment of weakness to strike, then I would still have a problem because I can’t swim, unless you count my skill at doing the backstroke a foot below the surface, which is the best they could do with me in high school gym class. And I don’t pack a snorkel. But Anne wanted to do it. We do a lot on our vacations, but sometimes we don’t get to do all the things on her personal wish list. Many of our stops on Day Four had been my idea, not hers. I couldn’t find it in me to say no. 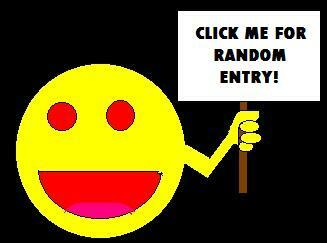 And besides, every so often I need a challenge, whether I like it or not. As we approached the kiosk, I psyched myself up for our experimental voyage and prayed to the Lord for guidance, strength, or at least a top-notch rescue squad on standby somewhere out there. Hundreds of visitors probably ride these every week. They’d be out of business and not an option if they’d racked up a high body count, right? Right? 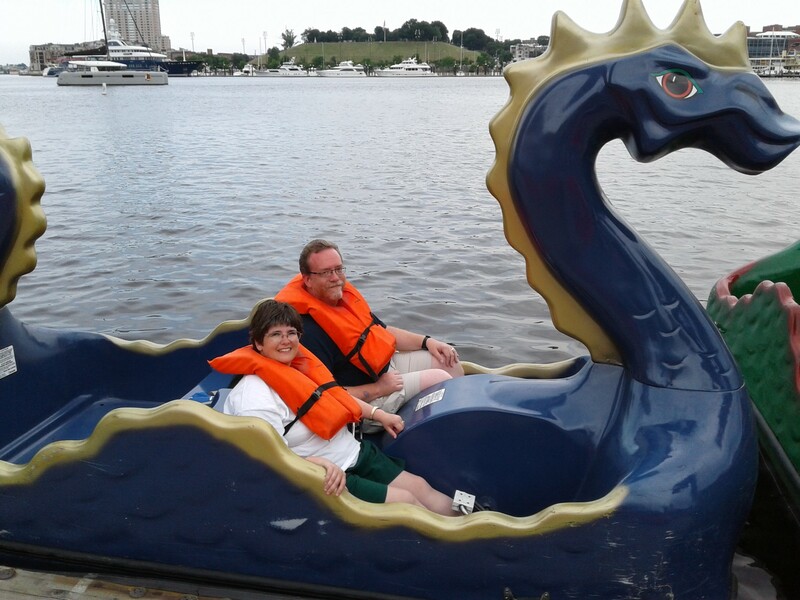 We donned our mandatory flotation vests — which thankfully come in my size — boarded the dragon they chose for us, posed for our lead photo, and were given approximately fifteen seconds’ worth of navigation tutorial. Pedal the pedals, steer with the handle, try not to run into things, and don’t go out of bounds. With these scant tips we would have to train our dragon. It sounded simple offhand. We headed out, clearly didn’t die, and took several photos while we were on the go. We take pride in the small joint victory that neither of us dropped our cameras or phones in the water. My view of the dragon’s-head bow. We started slowly at first, heading toward constructs you may recognize from several previous chapters. 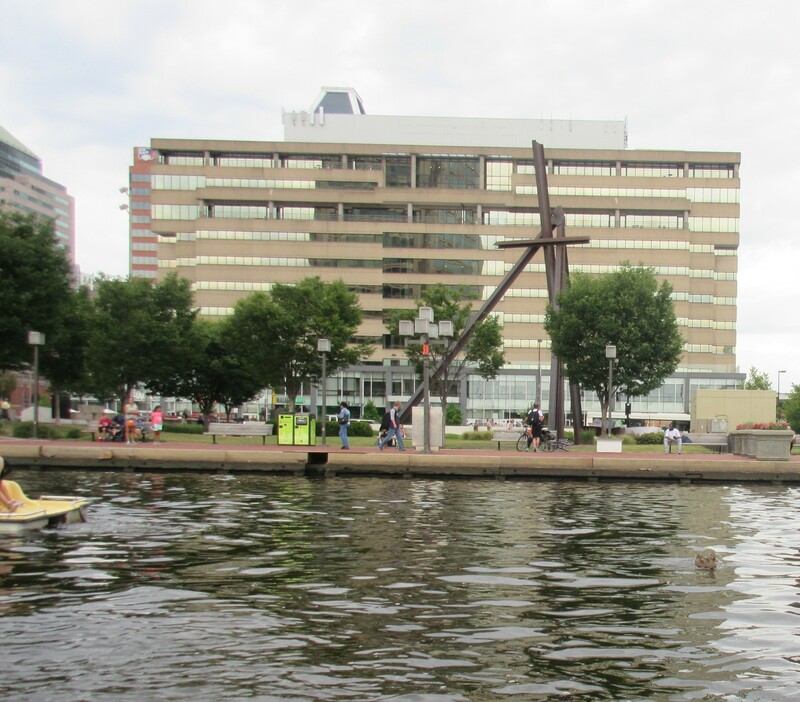 We were surrounded by sights we’d missed up till now, such as Mark Di Suvero’s 1980 girder sculpture “Under Sky/One Family”. After the first few minutes I realized that paddleboats are heavy and much harder to paddle than a lightweight bicycle. Much harder. 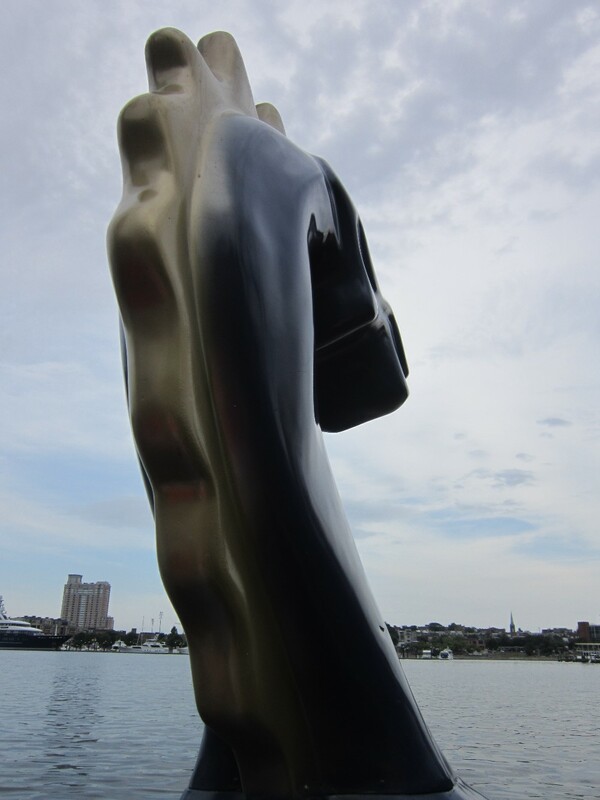 Over on the south shore was Federal Hill Park, down the street from the American Visionary Art Museum. I soon realized that the one-foot difference in our heights was putting most of the work on my side. Anne nevertheless kept her cute tiny legs furiously pumping for all they were worth. 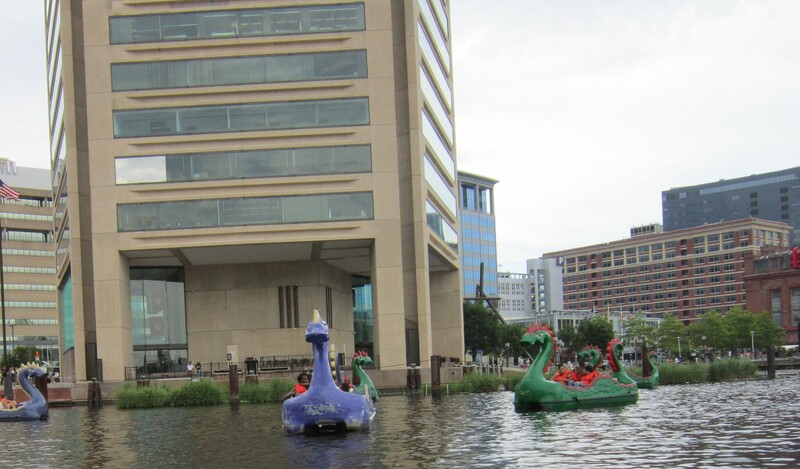 It was inevitable that other dragon boat crews would cross our path and present obstacles to circumnavigate. Keep in mind Day Four was an extremely long and busy day for us, and we’d been walking and walking for hours and possibly miles. My legs and I were already exhausted before we’d launched our dragon. The view of the dragon boat armada from the outermost perimeter. We were far from shore. Like, far far. If I had decided now was the perfect time to panic, they couldn’t just toss us a rope and reel us in. So I kept pedaling, and pushing past the pain, and pedaling. 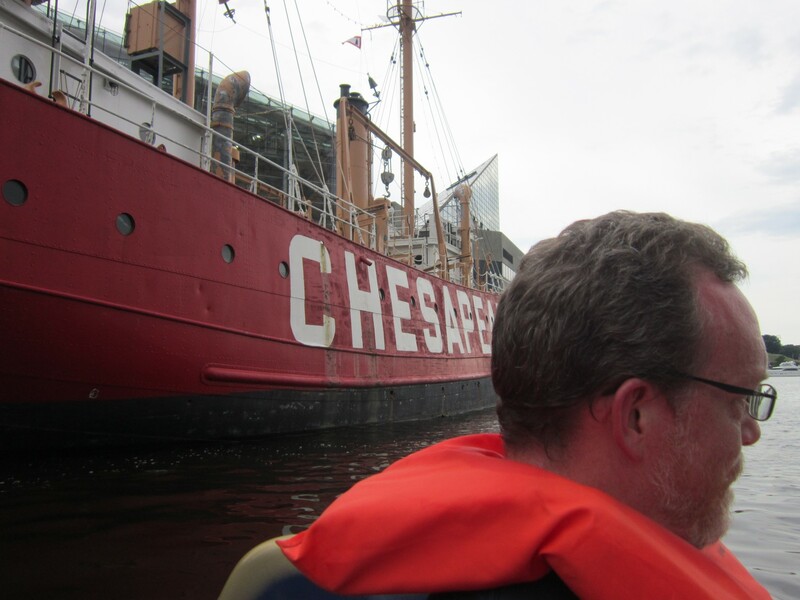 We’d toured the Lightship Chesapeake the day before, but her’s us finding a part we hadn’t seen up close yet. By this point I’d mastered steering and scrounged up just enough ounces of strength to avoid collision literally by inches. My reddening face is a combination of fear, determination, and sunburn. “You can do it!” says a well-meaning ducky, showing up to cheer us on. In my mind, anyway. I took it as a sign of God’s encouragement, or at least a symbol of His ever-watchful eyes upon us. Alternate dragon’s-head view. If I’d failed as a man and we floated out of control, this would also be our view as the current carried us out of the harbor, toward the Atlantic Ocean, and off to our new home on some distant shore, hopefully with a comic shop somewhere nearby. I’d had my doubts, but we did it. 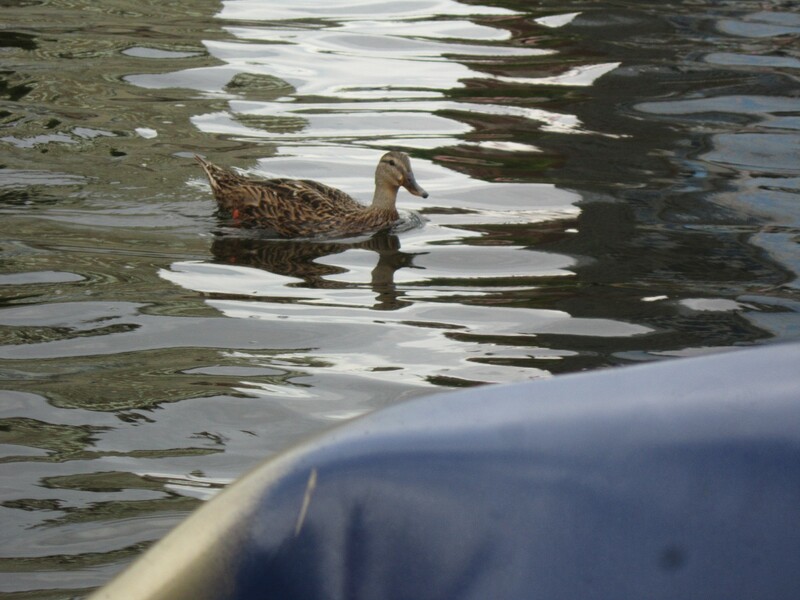 Our first attempt at self-service paddleboating was, by objective if modest measures, a success. Admittedly it’s easier to say that in hindsight months later. I would like to tell you that we learned an important lesson in that moment, that we congratulated each other for an awesome experience over dinner later, and that we ended the day on a high note of euphoric victory. I really, truly would. 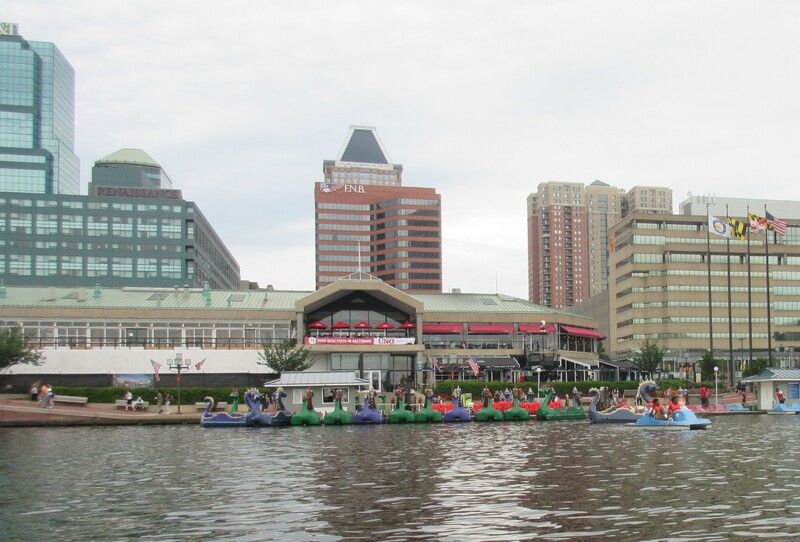 I love the paddle boats in the harbor! Glad you enjoyed.